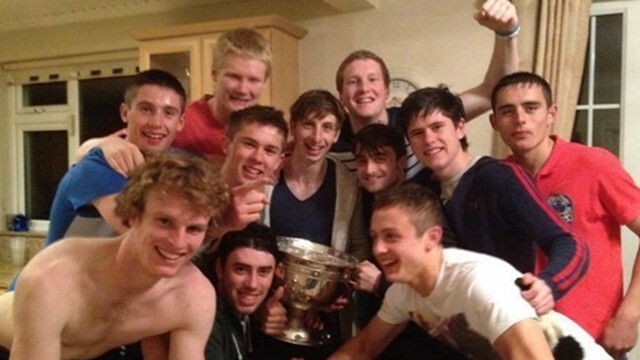 The ‘Harry Potter’ actor was in the Irish capital – where he is filming ‘The F Word’ –when he bumped into Dublin’s minor Gaelic Football team, who were celebrating winning the their first All Ireland title since 1984, on Sundayband joined them for a house party where he stayed until the early hours. After pictures of Daniel partying with the team surfaced on Facebook and twitter and a photograph of him holding the winning Tom Markham cup was published on joe.ie, one insider explained how it came about. The ‘F Word’ tells the story of a pair of twentysomethings - Wallace (Daniel) and Chantry (Zoe Kazan) - who hit it off after meeting at a party, but they are forced to keep their relationship platonic and decide to just be friends because Zoe's alter-ego has a long-term boyfriend. It is based on the play 'Toothpaste and Cigars' by T.J. Dawe and Michael Rinaldi.